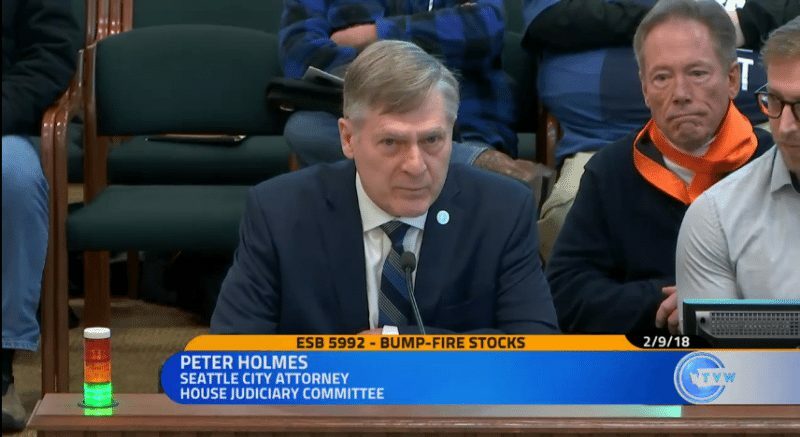 Anti-gunners in Washington State supporting a ban on so-called “bump stock” devices used a new term soon to be heard across the national landscape – “machine gun loophole” – during a legislative hearing Friday morning while there appears to be overwhelming opposition at the national and state level to such a ban. This effort comes as gun owners are demanding action on another gun-related subject, national Concealed Carry Reciprocity. CBS’ “60 Minutes” will air a segment on the controversy this Sunday evening. Carpenter noted that the federal Bureau of Alcohol, Tobacco, Firearms and Explosives (ATF) is currently re-evaluating the devices, which the agency approved under the Obama administration. By no small coincidence, The Trace reported earlier this week that 85 percent of people who offered comments to the ATF on bump stocks are opposed to banning them. Gun control is a lightning rod topic, and last week the Seattle Channel aired a 30-minute program that covered bump stocks and other proposals, most of which did not survive a legislative “cut off” deadline for action this week. An unscientific poll conducted after the program aired showed overwhelming opposition to any new gun control efforts in the Evergreen State with only 52 people supporting new gun laws and a whopping 2,891 opposed, at last count. Meanwhile, the “60 Minutes” segment will feature interviews with Tim Schmidt, president and founder of the U.S. Concealed Carry Association, along with anti-gun Manhattan District Attorney Cyrus Vance and New York City Police Commissioner James O’Neill. Also appearing, according to a CBS promotional announcement, will be Congressman Richard Hudson (R-NC), who sponsored the legislation (H.R. 38), and Robyn Thomas of the Giffords Law Center to Prevent Gun Violence. National CCW reciprocity is supported by major Second Amendment organizations. The most recent estimate on the number of citizens licensed to carry was over 16.3 million. Some gun owners are already expressing skepticism on social media about whether the CBS segment will present the reciprocity debate fairly. Readers will have to tune in Sunday evening and make up their own minds.